This tool allows you to add text to your artwork. You use it by doing + drag to create a rectangular selection. When releasing a default text will be created and the text editor window will pop-up. Hovering over other text shapes will highlight their bounding box. on a highlighted text will select it as the active text. The letter type used by newly created texts. The letter-size used by newly created texts. It is in pts (points), which is a common standard for fonts that is measured 72 points per inch. It therefore will stay proportionally the same size if you increase or decrease canvas dpi. Text alignment. This allows you to align text to the left, center it, or to the right. This is called text-anchor because svg 1.1’s multiline text only uses text-anchor, and this is a slight bit different than text-align (and also the reason justify isn’t available at the moment). This will summon the text editor for the currently selected shape. This can be quickly invoked with either pressing Enter or Double - the shape. A small window for all your text editing needs. The Text Editor has two tabs: Rich text and SVG source. Select the text with the shape selection tool (first tool). Press the Enter key. The text editor will appear. Select the text with the shape selection tool (first tool). Then click the Text tool. In the tool options there is an Edit Text button. When you click that the text editor window will appear. If you are unfamiliar with the way svg text works, use the rich text tab, it will allow you to edit the text as you see it, at the cost of not having all functionality. If you are a little bit more familiar with svg text, you can directly edit the SVG source. Do note that certain things, like stroke, fill, letter-spacing don’t convert back to the rich text editor, so do be careful when switching back. Press Save as you’re done with your edits to preview them on canvas. 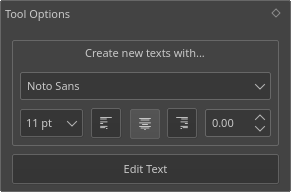 Save current edits to the text on canvas. Undo the last action in the text editor. Redo the last undone action in the text editor. Cut selected text to the clipboard. Select all text in the active editor. Pops up a window with an input to find the given text in the active editor. Searches for the next text using the last search key. Searches for the last text using the last search key. Pops up a dialog with two inputs: The string you wish to find, and the string you wish to replace it with. Will always replace ALL found instances. Pops up a dialog that allows you to search for special characters that are difficult to type in with your keyboard. Set the font-weight to bold. Sets the selected text italic. Adds a strike-through text decoration. Sets the text to super-script baseline. Sets the text to subscript baseline. Sets the font weight a little more specifically. Possibilities are… Light, Normal, Bold, and Black. Align the selected paragraph to the left. Align the selected paragraph to the right. Calls up the text-editor settings dialog. The settings that can be configured for the text editor. Whether you want both the Rich Text Editor and the SVG Source Editor, or only one of either. Here you can configure the syntax highlighting for the SVG source. The format for highlighting the element tag name. text and tspan are examples of element names. The format for highlighting the attributes of the tag. For example, font-family, when it isn’t in the style tag is usually written as an attribute. The format for highlighting value of attributes. This highlights xml comments, which are written as following: <!-- This is an xml comment -->. Comments are pieces of text that never get interpreted. The main color of the editor. The main background color of the editor. This allows you to filter the selection of fonts in the editor by writing system. Some systems have a lot of fonts specifically for showing foreign languages properly, but these might not be useful for you. You just tick the writing systems which you use yourself, and the font drop-down will only show fonts that have full support for that language. So, the rich text editor cannot control all functionality that SVG text allows for. For that, you will need to touch the SVG source directly. But to do that, you will first need to go to the text editor settings and enable either SVG Source or Both. The Rich Text editor will lose some information, so if you go all out, use SVG Source. These three are written and read from the rich text tab, but have no sliders associated with them, because there was no time. Kerning, in SVG 1.1 behaves slightly differently than font-kerning in css. Krita by default uses the auto property for this, which means it is on. To turn it off use kerning:0 in the style section of the text. This is the distance between letters in pts, usually. 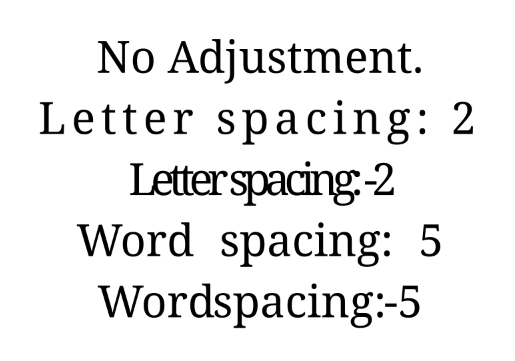 Just write letter-spacing in the style and add a distance in pts behind it. A negative value will decrease the value between letters. These are even finer-grained controls that can be used to position text. However, they CANNOT be reliably converted to the format of the rich text editor, because the rich text editor uses these to figure out if a line is a new-line and thus writes to these. X and Y are absolute coordinates. But because you cannot change the absolute coordinates of the text from the editor, these get added to the position when they show up in a tspan. These are relative coordinates to the position of the previous letter. These can also be stored and written to the rich text tab’s internal format, but they don’t get used in the on screen text object. These are not stored in the rich text right now, and while they can be written into the SVG text, the SVG text-shape doesn’t do anything with them. 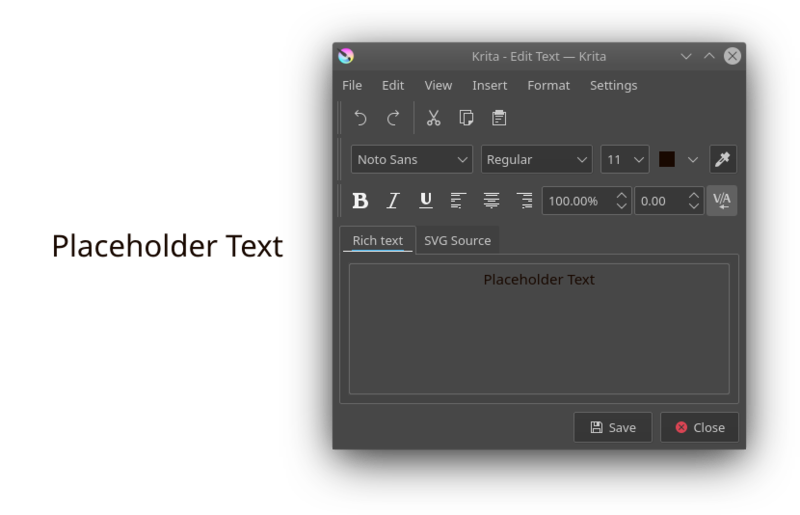 Krita generates font-size-adjust for the font when coming from rich text, as this can help designers when they want to use the SVG source as a basis for later adjustments.